Learn the difference between iPhone and Android based phones. We compare both devices on the basis of hardware, price, apps, battery, storage, operating system and security etc. This article would help you in making decision for buying an iPhone. I have been an Android user for last 7-8 years and I have used many handsets with several Android versions. But lately I thought of giving iPhone a try and I purchased an iPhone 6S. This is my very first encounter with the world-famous iPhone. So, it was inevitable that I would compare Android phone with iPhone. When I bought iPhone, it was not easy for me to operate it because I was completely used to with the interface of an Android based phone. I wanted to write this article on iPhone vs. Android much earlier but then I thought that I could be prejudiced if I don’t give myself enough time to become used to with iPhone. Now, it’s been four months since I have been using iPhone and I have become comfortable with it. I am also using several different kinds of iPhone apps. It seems to be the right time to let all the TechWelkin readers know my experience. Well, first of all, iPhone vs. Android is not exactly an accurate comparison. Why? This is because iPhone is a device whereas Android is an operating system. But in this article, when I say “Android”, I mean an Android based phone. Let’s see how these two things compare. 1. iPhone Hardware is Really Good! If you wonder why iPhone is so expensive, the answer is that the top quality hardware is used to assemble an iPhone. And of course quality comes at a price. Android phones are made by loads of manufacturers and they all offer phones based on all sorts of hardware configuration. You may feel dicey about hardware quality of an Android phone — but if your are buying an iPhone, you can be rest assured that you’re getting a machine built with top-notch hardware pieces. Lack of Back button in iPhone makes it difficult to go backward within an app. If you press Home button of iPhone, the whole app disappears and you arrive at the Home screen. Most of the iPhone apps do provide the option to go back, but this option always appears in the top bar of the screen. I find it difficult to swipe my finger all across the screen and tap the back option appearing near the top edge. If Apple does not want to provide a Back button, it may be a good idea to shift the options bar to the bottom edge of the screen. While using some of the iPhone apps, sometimes, I find myself at loss as to how to go back as there seem to be no way to go back at all. I understand this problem pertains to the bad UI/UX design created by the app developers. But still, I never felt locked inside an Android app. Removing an app icon from Home screen, removes the app itself! In Android, you can add or remove app icons on your Home screen. Removing an icon does not delete the app in Android. These are just a few specific points where iPhone’s interface lacks. In general also, I found Android interface more intuitive. Because of excellent hardware and a robust operating system (iOS), iPhone’s performance is assured. The phone works without a glitch. My Android phones used to hang a lot… but iPhone doesn’t hang at all (well, not so far at least!). Touch screen works very smoothly — there is no sign of jerky movement in screens. On a side note, I have managed to drop my iPhone a couple of times — and the glass screen is still all well! In my personal experience, the iPhone battery lasts longer than my previous Android phones. My usages of phone hasn’t changed — so, the comparison is fair. When I bought my iPhone, I was told that the battery may be a problem but so far I have felt that iPhone battery is doing much better. A full 100% charge easily lasts for 24 hours of regular use. When Google releases a new version of Android, a very low number of Android devices are able to upgrade to the new version. In contrast, older iPhone versions can easily be upgraded to newer iOS versions. Apple takes good care of backward hardware compatibility. Apple Inc. makes iPhone, iPad, MacBooks and Apple Watch etc. So, it is not surprising that the company has ensured easy integration among all these devices. If you use any of the two Apple devices, these machines will be seamlessly integrated with each other. In case of Android, device integration may not be as smooth because different devices are manufactured by different companies. iPhone uses several technologies patented by Apple Inc. The operating system iOS is exclusively developed by Apple Inc. iTunes App Store also uses very strict guidelines to be followed by the app developers. All this ensures that iPhone is a pretty secure device. In comparison, Android phones are developed by multiple developers and they customize Android according to their own needs. Android allows you to download and install apps from other places than the Play Store. Such apps are not scrutinized by Google and may contain malicious software. It is important for Android users that they use apps only from Play Store. iPhone is an expensive device. People do argue that if they buy an Android phone they get everything that iPhone offers at a much lower price. And this is, in fact, true! I guess most of the cost of iPhone is due to its hardware. Then some cost would also be because of the brand value. Apple makes so much profit from iPhone that it has made Apple the richest company in the world. There is no doubt that for most people iPhone is unnecessarily expensive phone. Why spend over a thousand dollars when you can buy a similar Android device in the range of US $150? However, if you can afford a US $1000 phone, iPhone is a good choice. Google Maps is way better than Apple’s own Map. We all notice that Google Maps is continuously getting more accurate and more feature rich. Apple’s map software comes nowhere near. However, this is not a reason for not buying an iPhone because you can install Google Maps on your iPhone as well. iPhone remains a much sought after device. It ensures that resale value of iPhone remains high even after a few years of use. In comparison, resale value of used Android phones is not as high. People do trust in the high quality of iPhone and they believe that even if they are buying an old iPhone, they will get good value for money. I have told you the difference between iPhone and Android based on my experience. Now let’s create a table for quick reference. iPhone is a proprietary product of Apple Inc. Android is a mobile operating system being developed by Google. But Google allows the phone manufacturers to customize Android according to their needs. iPhone is deemed to be more secure against malware attacks. Android is less secure. iPhone is generally more expensive as only Apple Inc. makes the phone. Android phones are made by a number of manufacturers. Competition ensures relatively lower price. iPhone can be easily and seamlessly integrated with other Apple devices like iPad and Macbook. Integration with other devices depends on compatibility. Although iPhone’s battery works better but it is a fixed battery. You can not take it out or change it yourself. Android phones generally come with removable battery. iOS operating system has been developed solely by Apple Inc. and thus it is a closed software. In the beginning, Android was open source but now Google has taken over its development. Older versions of iPhone can be easily upgraded to new versions of iOS. Not all phones support newest versions of Android. Entry of new apps in App Store is very strictly monitored. Apple rejects apps that do not conform to its guidelines. Google Play Store is relatively less strict in allowing new apps. Pre-installed apps are developed by Apple and are of good quality. Pre-installed apps and their quality varies as different manufacturers customize Android differently. It is common in Android phones that you can’t remove some of the pre-installed apps. iPhone comes with fixed storage capacity. You can not increase or decrease storage. Most Android phones allow extendable storage. So, you can add storage in addition to the internal storage. These were some of the important points of comparison between iPhone and Android phones. Of course their are many more differences but I have covered all the most important ones based on my personal experience. Are you an Android user? or an iPhone user? Please share your experience with us. 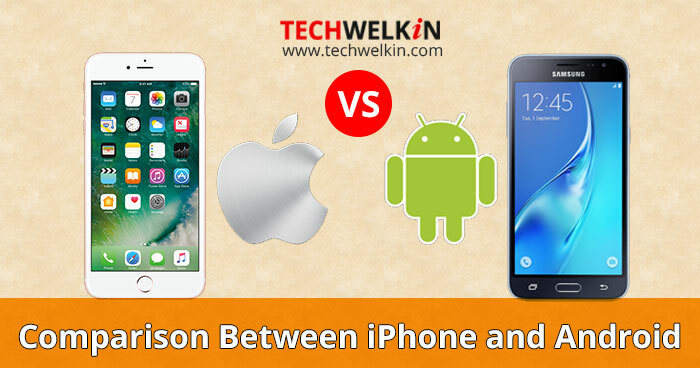 Last updated: 24 September 2017 | Published on: 14 June 2017 | Authored and Edited by: Lalit Kumar and Team | Filed as: Home » Hardware » Mobile Phones » iPhone vs. Android: Which is Better?